The First Game Console-Based Camera Accessory Was Called The? In The Early 19th Century, England Was Gripped By A Craze For? Today, there are cameras in so many things that we just take it for granted (or, perhaps, warily place tape over them while muttering about how many cameras are in everything). The tiny cameras are embedded in our phones, our portable gaming systems, our laptops, and even in the devices on our night stands thanks to Amazon and Google’s efforts to normalize cameras in the bedroom. But long before all this, there weren’t ubiquitous cameras everywhere and the very first video game console camera was a novelty to behold. That first venture into linking video inputs and video gaming was the Dreameye, released in 2000 for the Sega Dreamcast. 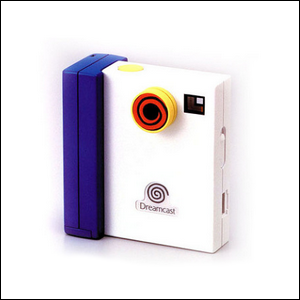 Like many elements of the ill-fated Dreamcast, the Dreameye was ahead of its time. It had a poor adoption rate, only worked with Japanese games (the non-Japanese versions of the games had the camera functionality removed), and otherwise foresaw a future where video was integrated into gaming, but was unable to effectively capitalize on it. Only two games were released for the Dreameye, Visual Park and DreamPhotoFun, neither of which made much of a solid argument for serious video gaming with a camera and instead had more in common with the photo filters and stickers found today in many smartphone apps. Image courtesy of Sega Retro.